There are many things I know, but not all of them are active in my life. A good friend is on my mind today and he recently wrote this book called “The Myth of Certainty and other great news”. (yes, you, Brian Perry) He is a very wise man, Brian, and his book is filled with what I have labeled “Brianisms”. One is standing out to me this morning and is the basis for what my fingers are telling me. There have been days lately where I have wondered what I’m attracting to cause this subtle feeling of unrest. In the process of trying to figure it out I spend a lot of time focused on the feeling, trying to shake it loose and let it go. And yet it persists. And things happen. Not so good things happen and the frustration continues. Bumps in the road. Annoying and at times treacherous. If you stumble or even fall flat on your face, you can’t help but look at it and ask “What the hell was that all about? !” I can spend an inordinate amount of time on that question. Meanwhile, the obstacle that caused this problem is feeding off my energy. MY energy. Guess what happens then? Exhaustion, illness, snarkiness and then mistakes are made. I may just as well crawl into the hole I’ve dug because no one wants to be in my presence. Not even me. So maybe Brian’s right. 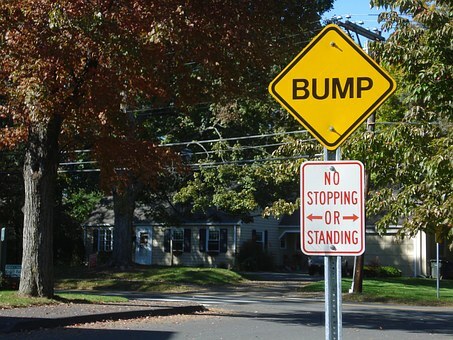 There are always going to be bumps. Hell, there will be mountains to conquer. See the obstacles but don’t stay focused on them. See them for what they are – speed bumps. Something is telling you to slow down and take time to breathe. Slow down and consider the work that needs to be done. Don’t keep looking at the problem that’s smack in front of you – you’ll find yourself stuck. Instead of using your energy to feed the problem, allow it to create something wonderful. Pay attention to the solution. But what if it’s not some “thing” that is the obstacle, but just a feeling? Like the feeling of unrest I’ve had? I can’t put my finger on anything specific but there is something… Back to what I know (and need to apply in my life): Acknowledge the feeling, but don’t analyse it. Use it to slow me down so that I can focus my attention on something beautiful, something peaceful, something worthwhile. Maybe, just maybe, this uncomfortable feeling is actually the birth of something new struggling its way to the surface. Now that’s something worth working to produce. Let me pay attention to that. Pay attention to what you are paying attention to. You may be surprised. I was. Thank you, Brian Perry, for being in my head this morning. Thank you, Diana! I am so honored! Perfect timing – pay attention to what I am paying attention to!! Heard similar idea this morning if I am being rub the wrong way is it showing me I might have work to do? Learning opportunity?